Celebrate What You Already Own. | A Continuous Lean. Celebrate What You Already Own. To be completely honest, Black Friday is a very bewildering time for me. I don’t know how to properly evaluate such a wildly excessive day in this consumer-obsessed country. This is especially conflicting for me because of this blog, a thing many view as a cheerleader of consumption. Over the past few years I have been more and more skeptical of Black Friday and have been exasperated by what has transpired on both sides of the register. Could you imagine being literally trampled to death in a big box retailer at 4am trying to buy a cheap flat screen t.v.? I’m having a hard time finding a more tragic way to go. This year the lines have been drawn slightly more clearly and the madness seems to be escalating and dissipating at the same time. The way things are going Black Friday and the national retailers seem poised to triumph over Thanksgiving. Some stores opened earlier than ever on Thursday and a few retailers shockingly stood up for the family holiday, advocating people actually spend time with their families. For better or worse, Black Friday has become a retail arms race. While I understand that the retailers want to try to capture as much of the holiday shopping dollars as possible (it seems it is a zero sum game; they do have stockholders to answer to after all) and many Americans want to stretch their own dollar as far as it can go to give their families a good life; it is still amazing to me that apparently nothing is scared in the quest for retail success, including one of America’s most significant family holidays. Is it really all worth it? That is the question I have been thinking about for the past few years. I have made a concerted effort to simplify my life in terms of what I buy and what I own. I have been trying to live up to these two mantras: Buy Less, Buy Better and Fix Don’t Replace. When I moved in with my fiancÃ© earlier this year, I donated or sold a significant portion of what I owned. I did this in an effort to simplify my life and to focus more on what I have rather than what I needed. Writing a blog like ACL and living in Manhattan don’t necessarily lend themselves to this concept. I’m sure that compared to others, a lot of people would still see me as Hamilton Swan. But the idea of buying something you know will last, or fixing something old seems to be resonating with a lot of people, including the people at Patagonia. The brand has unflinchingly balked at the Black Friday spectacle of years past going so far as to eschew the madness completely and run advertisements asking shoppers to think about whether they really need something new before they buy a new one. This year the Ventura, California company (who, full disclosure, is a Paul + Williams client) is actively helping people fix and repair their old stuff instead of pushing them to buy new. On top of it being a display of oft unseen common sense, it’s an audacious celebration of the things you already actually own. To illustrate this concept further and celebrate the people who would rather hold on to something old than buy something new, Patagonia enlisted the help of talented filmmakers Keith, Lauren, Chris, and Dan Malloy to produce an endearing short film called Worn Wear. Maybe the tide is turning? If you look at Small Business Saturday, Makers Monday, The American List and what Patagonia is doing, its clear people are starting to think about what they actually buying. After all, it really is the thought that counts. Really well written, this Black Friday craze almost over shadows Thanksgiving as people are really consumed with strategically getting to every store before whatâ€™s on â€œSaleâ€ is sold out. The idea of fixing what I already own is awesome, especially if the pieces are of good quality and where built to last. Either way, I do think Black Friday is a borderline waste of time, most of these stores routinely has similar sales and deals. Thanks for the wonderfully well-written, inspiring Thanksgiving vs Black Friday post. Also, the Hamilton Swan link is genius (and kinda timeless too !). A well thought out take on what has quickly become one of the worst days of the year. Thanks for the read. This is extremely well written and a great perspective on consumerism. It however seems a bit ironic on site like this, with Cartier advertisements running along the side. Also, this is very clever marketing on Patagonia’s part: We should only buy what we need and purchase high quality items that last for ever. Like you, I resent how retailers have encroached on previously-sacred family time. They knowingly interrupt Thanksgiving by tempting shopaholics with cheap doo-dads and low-quality TV sets. Often times, the deals really aren’t even anything special. 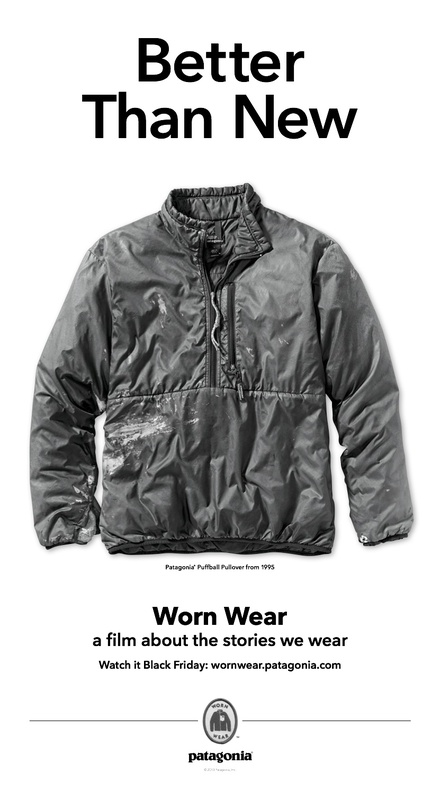 But I’m a bit more cynical about this “Worn Wear” campaign. Marketing is marketing, even when it undermines the prevailing market approach. We can celebrate the gear maker’s savvy, but if we believe that Patagonia hasn’t carefully crunched the numbers here, we’re fooling ourselves. Great post. I think this is something more companies should get involved with. I know that most companies exist to make money but they should also look at how responsible they are and try not to promote this ‘keeping up with the Jones'” style. Also, I’ve noticed more of a push in Britain about Black Friday this year, which seems odd as we don’t celebrate Thanks Giving, which means it sort of appears as a national holiday for shopping. Weird. 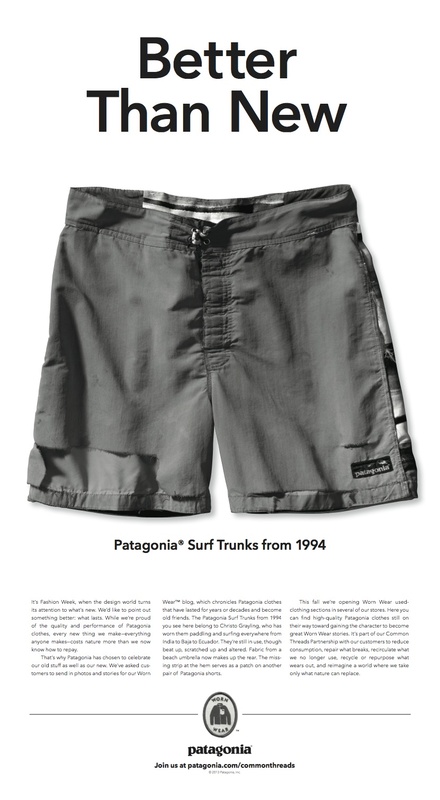 I remember when Patagonia gear lived up to its current marketing strategy/altruism. I still patronize them, but for a different reason…they used to sew their way to longevity and loyalty, now they warranty their way to the same end. I wanted to address the comment from The Outage regarding the marketing aspect of the Patagonia Worn Wear Campaign. First in full disclosure I worked for Patagonia for several years at the retail level. I would say without a doubt they are marketing in this campaign, and that it will ultimately bring them new customers as well as bring old ones back. In fact after their “don’t buy this jacket” campaign they saw an increase in overall sales nationwide. Having said that, I can say that Patagonia has always been forthright and open in that they are a company and one that wants to be profitable. The difference from other companies, and why their marketing isn’t insidious, comes in their fully integrated policy to make the best, and do it in the most environmentally safe ways possible or don’t make it. I can say that in my time there this was always preeminent in everything they did as a company. So I say bully for them, finding a way to be a responsible entity, and to do the right things when it’s often more profitable and easier to do the opposite. Wow, I’m failing the internet right now. It was in response to “the Outage” and the skepticism regarding Marketing being marketing. I have absolutely zero problem with Patagonia making money on their clothing. As an Alaskan, I know the value of well made gear- it could be the difference between life and death. That is not an overly dramatic statement. 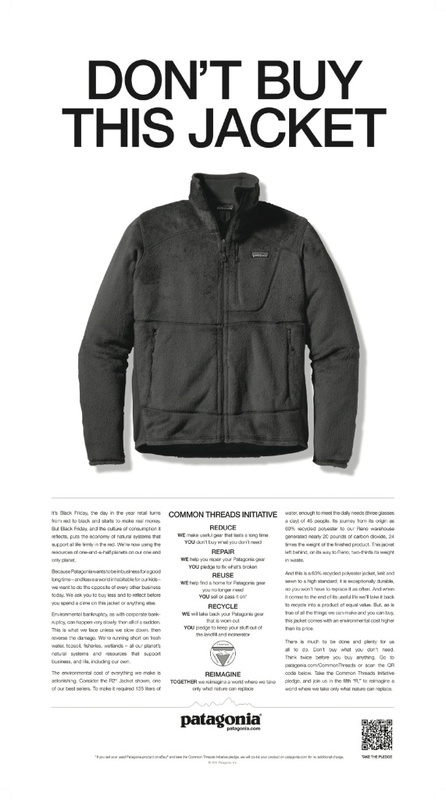 Bottom line: Patagonia makes things to do their job for a long time and do it well. We vote with our pocketbooks. I vote for what’s made to last. That’s what I call sustainable. Thank You for this little movie, Michael and Patagonia. This year black friday really came to my attention because of all the incidentes and horrible stories. Just today I saw a women with a taser, and using it too, bloody disgraceful. (we don’t have black friday in Portugal). Cheers, and keep up this amazing work at ACL. As the owner of a new online shop, I have found it to be very bewildering to navigate the craziness of Black Friday and Cyber Monday. I carry products from small producers in Europe and United States that I want to champion and that I want people to love and enjoy for a long time. Seeing this campaign by Patagonia, a company that I look up to and respect, has resolved me to ignore this whole sale craziness and continue to attract customers simply by offering the best products that I can in a compelling way. Thank you for sharing! Buy Less, Buy Better and Fix Donâ€™t Replace. How completely refreshing. I thought I was one of the few people who thought (and wrote) like this. Something to think about; if a brand can afford to slash prices by 70% or 80% and stay in business they are charging two much to begin with. This type of retail model is not sustainable when everyone is feeling the squeeze. Patagonia is not the only company with this sort of advertising, although it’s probably the only big one. Another small speciality manufacturer and retailer is, if I may mention them, is Empire Wool and Canvas Company. They only have about a dozen things, all for winter weathre. They specifically stated that they only hoped to sell you one thing and that it would the only one (of them) that you’d even need. It sounds good in theory but they do vary their designs over the years. That’s easier to do if you hand produce everything and don’t have a big stock of designs. But the stuff is somewhat expensive. I say “somewhat,” because the sky’s the limit on prices. Unfortunately, less expensive things are often just as practical, last just as long even though the quality is not so good because (this may surprise you) some people actually work for a living and get dirty, wear things out and can’t afford expensive products. They probably don’t live in Manhatten, either, unless you’re talking about Kansas.